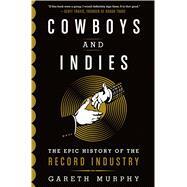 Cowboys and Indies is nothing less than the first definitive history of the recording industry on both sides of the Atlantic. From the invention of the earliest known sound-recording device in 1850s Paris to the CD crash and digital boom today, author and industry insider Gareth Murphy takes readers on an immensely entertaining and encyclopedic ride through the many cataclysmic musical, cultural, and technological changes that shaped a century and a half of the industry. ...and much, much more. Murphy also offers a provocative look at the future through the ruminations of such vanguard figures as Martin Mills (4AD, XL Recordings, Matador, Rough Trade) and genre-busting producer Rick Rubin (Run-D.M.C., Red Hot Chili Peppers, Metallica, Johnny Cash). Drawing from memoirs, archives, and more than one hundred exclusive interviews with the legends of the record industry, including the founders and CEOs of Atlantic, Chrysalis, Virgin, A&M, Sub Pop, and Sire, this book reveals the secret history behind the hit-making craft. Remarkable in scope and impressive in depth, Cowboys and Indies chronicles the pioneers who set the stylus on the most important labels and musical discoveries in history. GARETH MURPHY was raised in Dublin surrounded by music and the musicians his father worked with as a concert promoter. A graduate of University College Dublin, Murphy has worked at various record companies and has produced thirty electronic compilations. Composing and producing original music, he is a freelance writer and researcher for journals and think-tanks. Murphy lives in Paris with his wife and four year old son.